Amprobe s ACD-10 PLUS meter offers thinner jaws over standard clamp meters, allowing access to tight measurement areas and still accommodating conductors up to 25 mm. It also measures Capacitance and Frequency. Frequency is measured by either jaws or test leads. 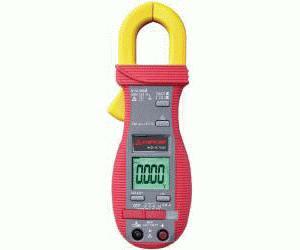 Very versatile clamp multimeter.